Gino Severini, Natura Morta con Arance. Estimate: 400,000-600,000 GBP. Photo: Sotheby's. LONDON.- Sotheby's announces that its forthcoming 20th Century Italian Art Sale on Thursday, October 13, 2011 will be the companys strongest ever, both in number of lots offered and the quality of works featured. Expected to realise between £15,872,000 and £21,718,000, it is also the highest estimated sale in this collecting category ever staged by an auction house. The sale, which is highlighted by two important private collections Italian Identity and Property from an Important New York Collection, features works by Alberto Burri, Gino Severini, Lucio Fontana and Marino Marini among many others. Headlining the sale will be an exceptional private collection of Italian Art that spans the whole of the 20th century. The collection, Italian Identity, represents all of the major developments in Italian Avant-garde art and is highlighted by the most comprehensive group of Arte Povera ever to come to the open market. The collection, which includes pieces by Giorgio de Chirico, Giorgio Morandi, Alberto Burri, Piero Manzoni, Alighiero Boetti and Michelangelo Pistoletto, is estimated to realise in excess of £7 million. One of the most important highlights in the collection is from a series initiated in 1957 comprising nearly 60 works in total, Combustione Legno, executed during same year, is the very first combusted wooden piece produced in this large scale by the immensely influential Alberto Burri (1915-1995). Preceded only by a small experimental work significantly smaller than the present Combustione, this piece stands as the most compositionally resolved of these formative examples and is estimated at £800,000-1,200,000. Four lots in the sale come from the Estate of an American collector, whose home was filled with a wonderful variety of late 19th to mid-20th century art. The collectors spacious townhouse barely contained an uncovered wall, with original art nouveau drawings by Alphonse Mucha alongside exceptional examples of Czech Cubism, Italian Futurism, Picasso ceramics, French Impressionism, and early Modernism. The superb Marini Cavaliere in this sale was exhibited just below a marvellous Calder mobile, and within view of important bronzes by Henry Moore: just one example of many daring displays in the house, and evidence of the collectors distinctive curatorial eye. The collector had an inexhaustible appetite for learning and knowledge, and he had a large and eclectic library that filled the top floor of his house. A frequent visitor to Europe, this successful businessman and erudite polymath befriended many of the great dealers of the post-war era and acquired many of his works directly from the artists themselves**. The horse and rider is Marino Marini's (1901-1980) most important and enduring artistic theme and Cavaliere is a particularly dramatic and magnificent example. The sculpture, which was gifted to the collector  whose passion for art was sincere and captivating  by the great supporter of Modern Italian Art, Eric Estorick, was conceived in 1951 and cast in bronze in an edition of 4. It is a wonderful example of the artist's transition towards a more expressive style. In the years before and during the Second World War, Marini endowed his horses with a grace and poise that nodded to classical sculpture. In the 1950s, however, the subject was injected with an intensity and dynamism that reflected the post-war mood of anguish and instability. The horse is still steadily planted on the ground, but its tense, outstretched neck and head, and the precarious positioning and pose of the rider give the work a more perilous character. This is typical of Marini's mature works, where his horsemen become increasingly insecure in their mounts, flinging their arms out to break their fall, or slipping helplessly off the horse's back. The present work captures a precise and critical moment in time, the moment when the fall of the rider becomes inevitable. It is characterised by an exceptional intensity of expression, and this is complemented by its beautifully varied hand-chiselled surface, a testament to the artist's almost painterly approach to finish. The polychrome plaster model of Cavaliere belongs to the Carnegie Museum of Art, Pittsburgh and another of the bronze casts can be found in the Fogg Art Museum, Harvard University, Cambridge, Massachusetts. Cavaliere carries an estimate of £800,000-1,200,000. Gino Severinis (1883-1966) charcoal and chalk on paper, Train arrivant a Paris, was executed in 1915 and is the product of what is arguably Severini's most exciting and innovative period. It is one of very few works of this subject and date to remain in private hands and the very closely related oil Train de banlieue arrivant à Paris is in Tate Gallery's permanent collection, and Train de la Croix Rouge traversant au village was in Solomon R. Guggenheim's founding collection, in whose museum it remains today. Severini did not present his war paintings publically until his Plastic Art of War Paris exhibition of 1916, in which the present work featured. Whereas the Cubists mostly limited themselves to the still life genre, the Futurists burst out onto the streets, the railways, and the battlefield. The present work shows a train hurtling at top speed to into the French capital: its rocketing power is not confined to the tracks, and the suburban landscape through which the train passes is catapulted into action, and imbued with the vehicle's precarious dynamism. If Futurism is a celebration of speed, war and technology, then the train is its perfect paradigm. That Severini's work from this period is dominated by images of trains is hardly surprising, given that he spent the summer of 1915 near a strategic railway station outside Paris. This exceptional example is estimated at £500,000-700,000. Gino Severini's (1883-1966) oil and sand on board Natura morta con arance, which was executed in Paris in 1917, is an exceptional example of a pivotal period in Severini's artistic development. In 1916, Severini appeared to abandon Futurism for Cubism, and was taken under the wing of Léonce Rosenberg, as one his artists at the Galerie de l'Effort Moderne, joining the most prestigious names in French Cubism, including Gris, Braque and Metzinger. Though the theories of Futurism and Cubism may not be entirely compatible, their shared rejection of Renaissance perspective, in favour of a more simultaneous multiple perspective, resulted in a comparable fragmented aesthetic, where form is flattened and space loses all depth. Even to a contemporary viewer, whose eye is now familiar with the Cubist aesthetic, the present work still represents a disorientating spatial experience. The viewer feels that at any moment the oranges might fall from the composition, or be crushed by one of the forms looming above them. The foreground is not allowed to dominate the background, and all the flattened forms are pushed right up to the picture plane, creating a precarious atmosphere, where the table no longer appears capable of supporting its wares. 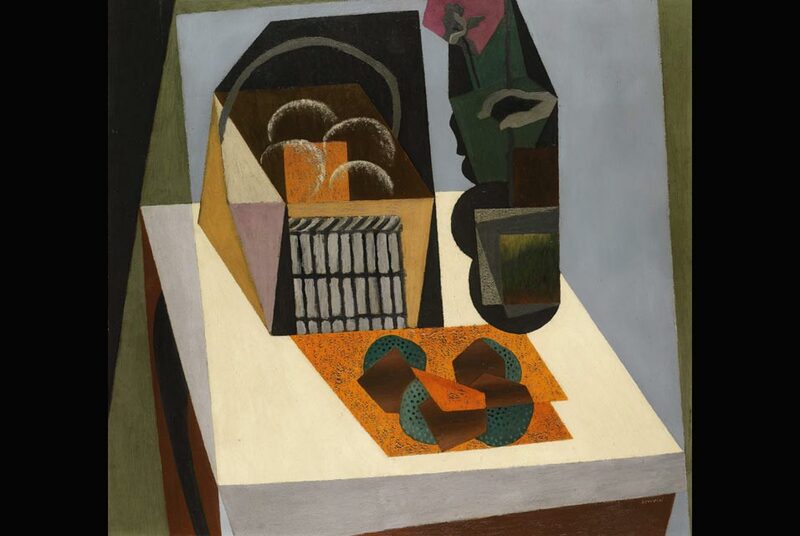 The genre of the still life had traditionally been a familiar and safe one, but Natura morta con arance is a remarkable example of the inherently radical nature of Cubist and Futurist visual research. As well as being a wonderful example of flattened, fragmented form, Natura morta con arance is also testament to Severini's innovative approach to surface. This outstanding painting, which represents an important example of Severinis foray into Cubism, has remained off the market for more than 40 years and is estimated at £400,000-600,000. The collection also features two further works which demonstrate the artists shared appreciation for ancient friezes and render this group a true, and appropriately eclectic, survey of Modern Italian Art: Massimo Campiglis (1895-1971) 1957 oil on canvas Donne su fondo rosso (est. £120,000-180,000) and Mario Sironis (1885-1961) oil on canvas La Ventura, Oracolo (Moltiplicazione) (est. £45,000-65,000). Highlighting the contemporary works from the various owners section of the auction is Alberto Burri's (1915-1995) magnificent Rosso Plastica L.A., which is an outstanding example of the artist's revolutionary series of combusted plastic works. Heralded as the first artist to introduce the reality of nature and the everyday into the work of art, Burri first forged a dialogue with the alchemical potential of fire in 1957, initiating his first Plastiche works in 1960. Unparalleled in its remarkable poeticism, Rosso Plastica L.A. represents the very apotheosis of the celebrated Plastiche series. Executed in 1963, this artwork was prestigiously exhibited with the travelling Museum of Modern Art exhibition Alberto Burri and Lucio Fontana between 1966 and 1968. Extraordinary for its dense treacle-like surface, the present work illuminates the artists ground-breaking explorations into the power and sensuality of materials, and the natural force of fire. Rosso Plastica L.A. can be regarded as the very highest achievement of Burri's illustrious career and is estimated at £850,000-1,200,000.